Denise Bookwalter and AB Gorham will represent Small Craft Advisory Press at the CODEX International Bookfair and Symposium in Berkley, California, February 8-11. SCAP is registered for the 4-day bookfair that includes almost 200 book artists and fine press publishers, at which they will feature a few of their most recent editions, including Lining, Lake/Cloud and vvvvv, a collaboration with Florida State University art professor, Judy Rushin. Lining is about the fabric in clothing that goes next to the skin. Many garments are lined with specific fabrics chosen for their softness, pattern or warmth. 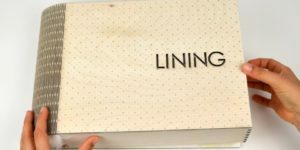 Lining represents five of these fabrics within its pages. Each of the five fabrics is mounted on a page that folds out revealing it as a lining of that page. Cut into the pages are microscopic images of each of the fabrics and a poem accompanies the lining fabric with a poetic description of the textiles. The book itself is lined with actual rabbit fur and prints of rabbit, also a material used for lining gloves and other warm clothing. Read more. Lake + Cloud, is a collaboration between Katie Baldwin and SCAP Director Denise Bookwalter that explores the expansive act of reading by altering the reader’s physical space. The book includes two parachutes, one white and one blue, that are pulled form the book and placed in the reader’s space to make a representation of a lake and a cloud. 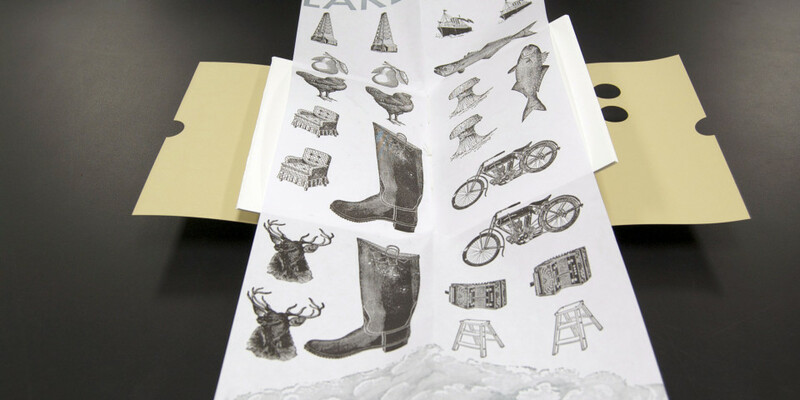 Included with the lake and cloud props is a letterpresses instruction book that encourages the reader to experiment and instructs them how to put things away again for the next reader. Read more.